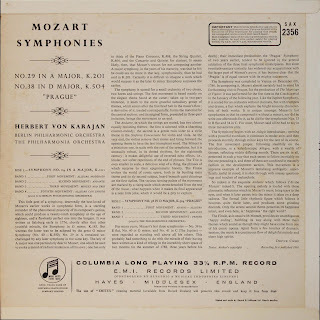 Comments: This album of Mozart symphonies with Herbert von Karajan conducting both the Berlin Philharmonic and the Philharmonia is a Columbia SAX which does not pop up on Ebay all that often (Popsike shows 5 listings in the last 12 months). To my knowledge, this was only released as a blue/silver pressing on the SAX label. The record has a lovely laminated cream/white cover with a painting of what I assume to be the city of Prague a couple centuries ago. 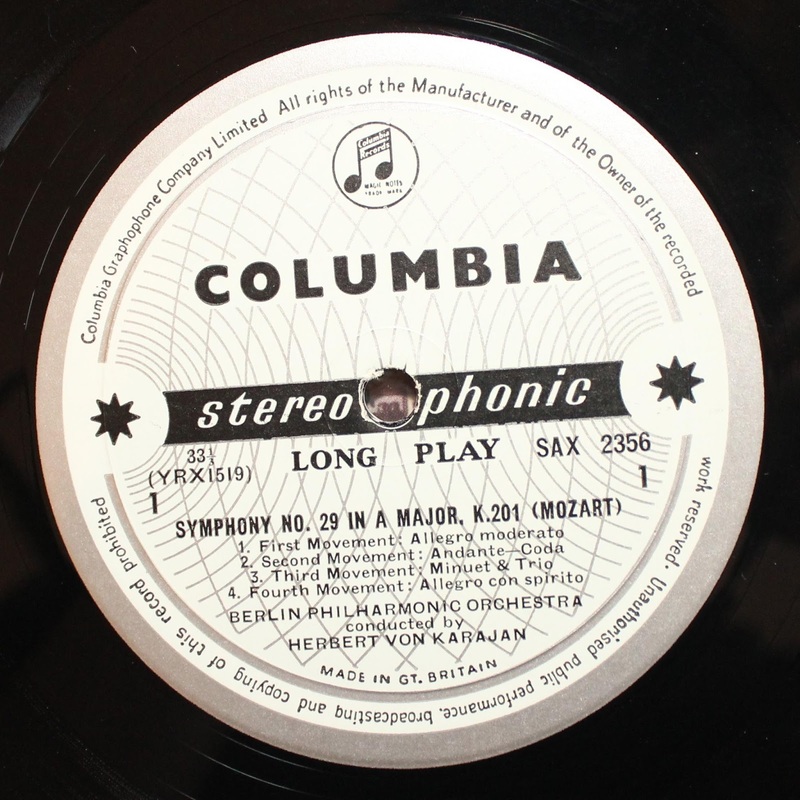 Liner notes are provide by the British musician, musicologist, and BBC broadcaster Deryck Cooke. 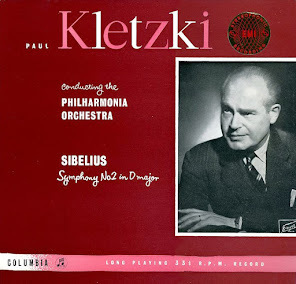 We have here an interesting juxtaposition of two very different orchestras in two different recording venues with the same conductor. The results couldn't be more different. 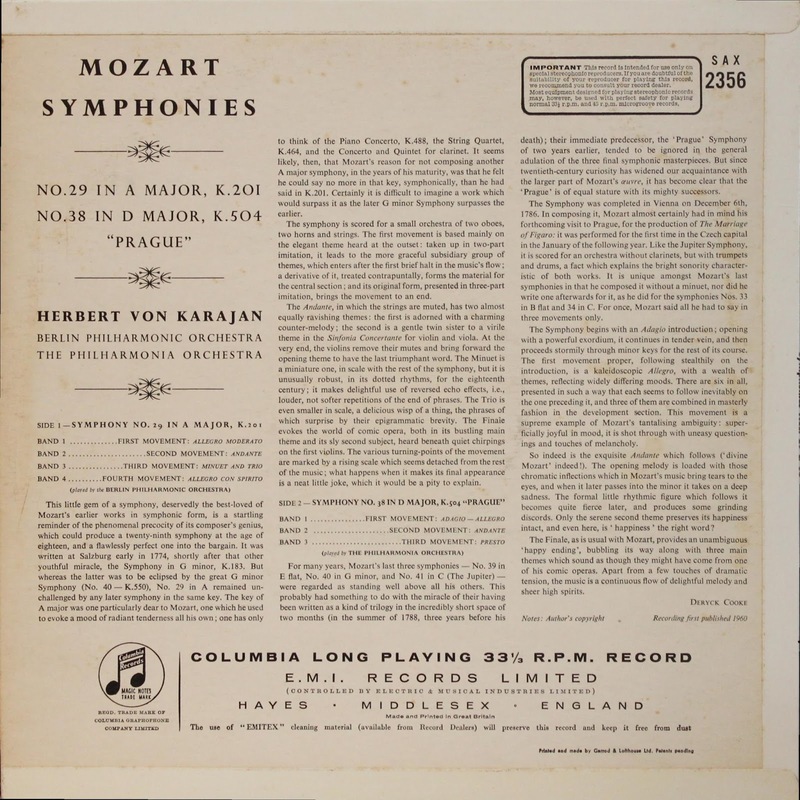 Side 1 was recorded with the Berlin Philharmonic on February 29th and March 1st, 1960 at the Grünewaldkirche, Berlin. The presentation here is quite laid back. I felt like I was sitting at least mid-way back in the concert hall. Dynamic range was decent but not great, but I could appreciate the clarity of the orchestral sound. 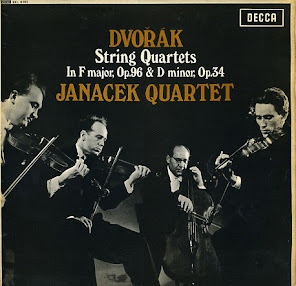 Strings sounded syrupy, which may have been Karajan's influence. 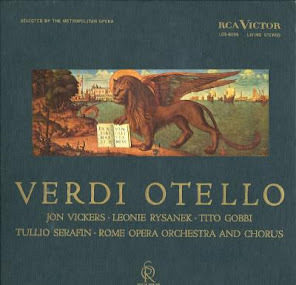 For romantic music, I think that can work well, but I find it less fitting for Mozart. 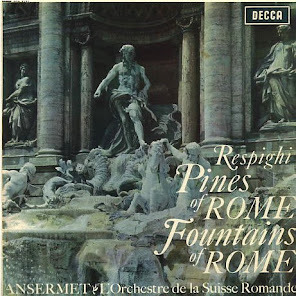 After what sounded like more romanticized Mozart on Side 1, Side 2 was refreshing. This performance of the Symphony No. 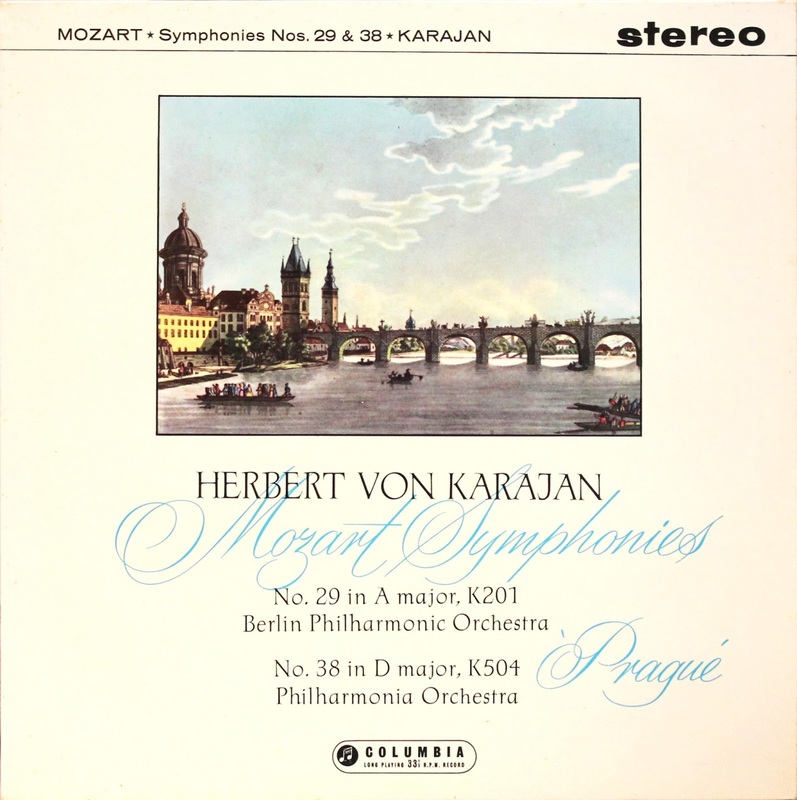 38 "Prague" was recorded with the Phiharmonia on September 16th-17th, 1958 at the Musikvereinssal, Vienna. Here, the presentation was far more immediate without sounding too close, and dynamic range was considerably improved. 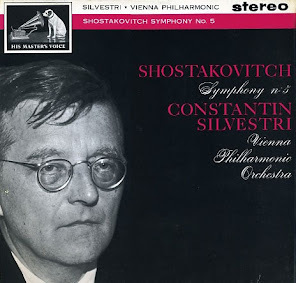 The Philharmonia strings sounded punchier and more articulated, which gave the performance more energy, and winds could be heard crisply and clearly. 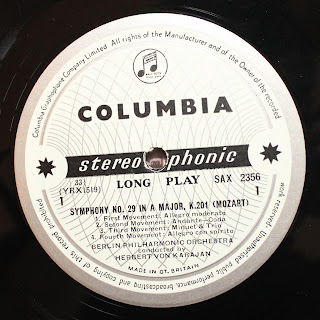 In general, the music on Side 2 was just more involving to me. 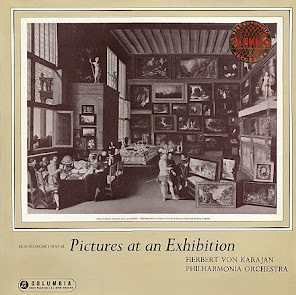 Amazing that the Philharmonia was recorded in Vienna. They must have been on tour. 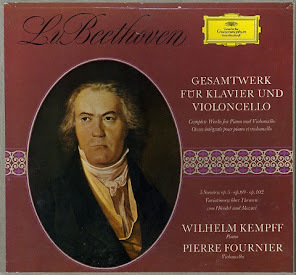 SAX 2312-2313 Beethoven Missa Soleminis was recorded the same week.